Heat oil + ghee in a pressure cooker, add all whole spices like cardam0m, cloves, etc & allow to temper , add sliced onion and caramelise it. Add pureed tomato,ginger garlic paste, turmeric powder, Home made biryani Masala, red chilli powder & allow to cook until all raw flavour extracts. Add all vegetables & soaked basmati rice. Mix gently & add 3 1/2 cups of water. Pressure cook upto 1 whisle and make it sim upto 5 mins. Garnish with cilantro & Serve hot with any veg Masala OR Raithas. Breaking the break with a blast??? The biiriyani looks very ymmmy and tasty!!! nice pic!!! 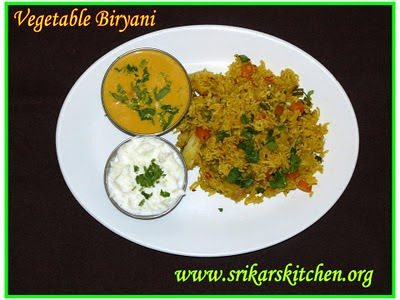 Briyani looks very colorful...looks like you are back after a break..new to your blog and following you ! my all time favourite is veg biryani...healthy one. Biryani recipe sounds very delicious ..
Good to see u back dear...Biryani looks so yummy!! This is exactly what I need to make during this season. Nice recipe. hey good to see you back in the blog world. biriyani super. will try your version. how r u?